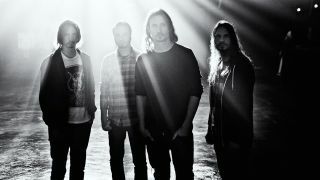 Four albums from Gojira’s back catalogue are to be re-released on limited-edition colour vinyl in January. The Link (2003), From Mars To Sirius (2005) and The Way Of All Flesh (2008) will be issued via Listenable Records, with each pressed on heavyweight 180g coloured vinyl. Only 500 copies of each album are being released. Their 2004 live album The Link Alive will arrive in double gatefold packaging, with both discs presented on red, green and orange vinyl. All four records are available for pre-order. Gojira are planning to release their sixth album and follow-up to 2012’s L’Enfant Sauvage in 2016.